Gift Hampers Sydney loves - that's our specialisation here at The Hamper Emporium! Proudly founded and based in Sydney, we're excited to live and work in this wonderful city, and even prouder to offer the best Sydney hampers available. We offer same-day Sydney hamper delivery for orders placed before 10am weekdays, along with express courier delivery upgrades, so if you're looking to send a local Sydney gift hamper to someone special, in a hurry, then we have you covered. Bestselling Sydney Gift Hampers With Same Day Delivery Options Available. 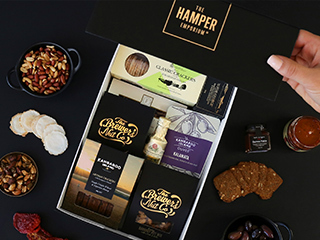 The Hamper Emporium’s Sydney hampers are the premium choice for every occasion! We love being based in Sydney, this amazing city is full of fun, culture and opportunity and offering exclusive delivery services to the city we call our home is something we’re extremely proud of. 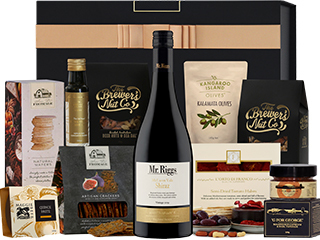 We’re Sydney’s best-selling hamper store for a reason, not only can you browse our online gift hamper range at your convenience, inside our exclusive hampers, your recipient will receive a range of gourmet and artisan produce that simply isn’t available elsewhere. If you’re looking to have a gift delivered in Sydney, then know that all our gift hampers are filled with expertly curated goodies from the world’s finest producers and presented in luxury gift boxes, so your present always stands out in style. We know you don't have time to walk the streets looking for the perfect gift for friends and family, which is why we've done all the hard work for you! 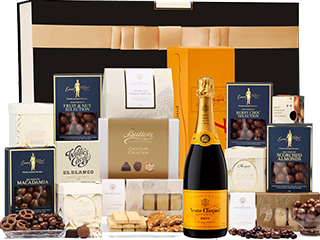 All you need to do is browse our online gift store and choose one of our luxury gourmet gift boxes and we do the rest. With everything from artisan Australian-made produce, to the world's finest wine and spirits, it's all here to choose from. We specialise in fast delivery of gourmet produce, pamper hampers and award-winning wine right to the door, whether it's for a friend, father, mum, brother, sister or colleague, there's a value-packed hamper available and in stock just waiting to bring a smile to their face. Perhaps you need a gift for someone who lives in Sydney and you're ordering from interstate or overseas? With over 200,000 happy customers, you can trust that we know gifts, and we know hampers, and we know how to bring joy to our customers right across Australia. Let’s take a look at some of the amazing produce and gift hampers available on our site, and some of the most common questions we're asked about our Sydney gift hamper range. 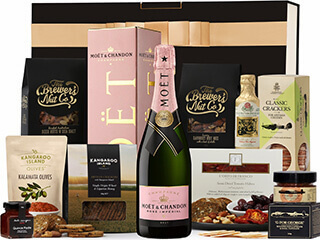 What Occasions Are Suitable For Sending A Hamper? Our customers truly love sending gift hampers across Sydney for all types of occasions. We not only specialise in personalised gift hampers including custom leather accessories for both men and women, we also offer a range of affordable gift hampers both with and without alcohol. We’ve delivered happiness to over 200,000 customers, and there’s a reason our customers keep coming back occasion after occasion to let us bring a smile to the faces of people they care about. Whether it’s a birthday gift hamper for women, a congratulations gift hamper for men, or corporate gift hampers to celebrate a new home or a client, if there’s an occasion for it, we’ve delivered hampers within Sydney and of course, right across Australia. What Products Are Inside Our Most Popular Sydney Hampers? We’ve spent over a decade refining our gift hampers, not only are all our hampers presented in stunning luxury keepsake gift hamper boxes or handcrafted wooden hamper boxes, they are packed full of exclusive goodies we now will make the right impression both in appearance, flavour and luxury. 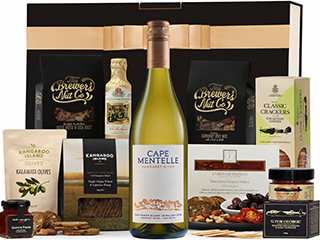 We’ve worked with some of the finest gourmet producers across Australia and across the world, to create a specially curated range of hampers for Sydney. From the hidden luxury of Kangaroo Island, we've sourced a selection of beautiful gourmet nibbles that celebrate the beauty of the Australian landscape and unique flavours. From around the world there's exquisite chocolate from Willie's Cacao, exquisite Italian olive oil and of course the finest in French Champagne and our very own Australian artisan beer, we've got everyone covered. Let’s take a look at some of the amazing products and brands that can be found within our hamper collection. 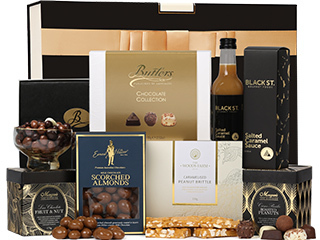 The Butlers Handmade Chocolate Collection is a luxury boxed chocolate assortment from Butlers Irish Chocolates. The assortment of chocolates consists of 7 mouth-watering chocolates, including truffles and pralines. Flavours include classics such as milk chocolate truffle, white chocolate, hazelnut praline and dark chocolate espresso. Butlers Irish Chocolates is a chocolatier with an impeccable reputation. The original founder of the company, Marion Butler, created the first collection of handmade chocolates in 1932. The luxury creations were called “Chez Nous Chocolates” and conquered the hearts of Georgian Dublin. Since the founding of the company, Butlers Irish Chocolates has continued to evolve. The company was bought by the Sorensen family, who named the company after Marion Butler and continued her tradition of handmade chocolates and superior flavours. Now, Butlers Irish Chocolates is known across the globe and boast several awards for their handcrafted chocolates. What’s not to love? If you want to get a Butlers Handmade Chocolate Collection as a gift, be sure to check out our Christmas Bites Xmas Hamper. Why is Veuve Clicquot Yellow Label NV Champagne So Impressive? The Veuve Clicquot Yellow Label NV Champagne is always a big hit on Valentine’s Day, because there is nothing as romantic as a good glass of champagne on the most romantic day of the year. During your declaration of love, Veuve Clicquot Yellow Label will provide you with a full-bodied champagne with ripe apple flavours. This is a great Champagne to combine with a luxurious gourmet dinner, making it perfect for all occasions, not just for romantic gift hampers. 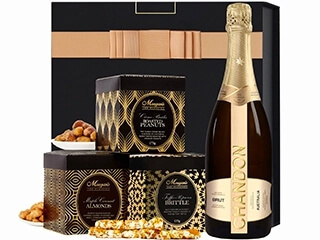 Customers who truly want to make a perfect impression and gift this exquisite Champagne can find it in our Luxury Chocolate & Champagne Hamper, one of the most popular Hamper Emporium releases for romantic occasions. In addition to a luxurious bottle of Veuve Clicquot, customers will also receive a selection of Butlers Irish Chocolates, Maison Fossier biscuits, and Morgan’s honey roasted peanuts to make your romantic evening unforgettable. When you want the best champagne France has to offer, you need to be looking for Moet & Chandon Brut Imperial NV Champagne. Moet champagne is created from more than a hundred different wines, of which approximately 20 to 30 percent reserve wines; this is done to give the champagne more maturity, complexity and constancy. 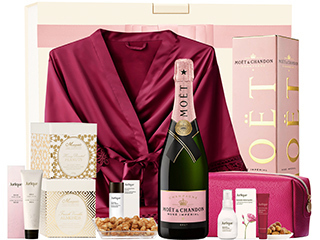 Considering Moet & Chandon Brut Imperial NV Champagne is the flagship of the Moet & Chandon champagne house, this champagne needed to be added to some of our best hampers. 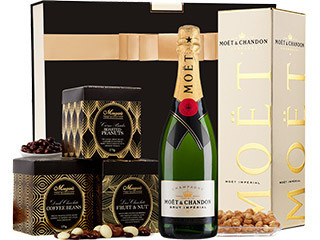 Customers interested in this champagne can find it in the Moet with Australian Chocolates & Nuts, which also contains a selection of Morgan’s nibbles. Do We Deliver Australian Beer Hampers In Sydney? Any self-respecting beer lover in Australia knows the James Squire brewery and their incredible selection of craft beers. One of these craft beers is the Nine Tales Amber Ale, a full-bodied beer with the sweetness of caramels and a nutty finish. We love the history and flavours of James Squire brews. 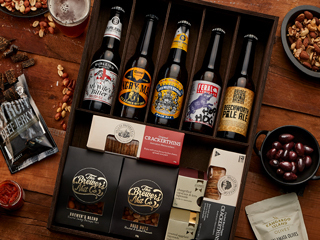 Thanks to the unique flavours of Australian beer, they're a true favourite in our Sydney gift hamper range. Of course it's not just sydney delivery of beer hampers we offer, there's plenty of wine and whisky options too. Customers who would like to gift this craft beer to a friend or relative can find this beer in our James Squire Ale Hamper. As the name suggests, this hamper offers you the best beers from the James Squire brewery. In addition to Nine Tales Amber Ale, you can also obtain the Chancer, One Fifty Lashes Pale Ale and Stow Away India Pale Ale. The hamper also contains an incredible selection of nibbles, so this hamper is suitable for beer lovers as well as foodies. Are the Products Inside Our Sydney Hampers Suitable for the Holiday Season? Many Sydney hampers contain exquisite products that match the holiday season, or any occasion. Therefore, customers will find that our Sydney hampers are the perfect choice for Christmas hampers over the holiday season. Naturally, we have a range of dedicated Christmas hampers too, so you are never out of options at the Hamper Emporium. When ordering your Christmas hampers this year, please make sure to order your Christmas hampers with plenty of time. Even though we aim to get all Christmas hampers delivered to match our estimated delivery times, delays with couriers and the postal service are not uncommon during this time of year. So, be sure you put your Christmas hampers on early this year! The Hamper Emporium Offers Exclusive Melbourne Gift Hampers Too! At the Hamper Emporium, customers can find suitable gift baskets for all areas of Australia. Therefore, it is only natural that we provide a range of Melbourne hampers to our customers too! The Melbourne hampers at the Hamper Emporium provide the same benefits as our Sydney hampers. Hamper Emporium’s Melbourne hampers are packed with gourmet treats, excellent wines, champagnes, chocolates, and a whole lot more. 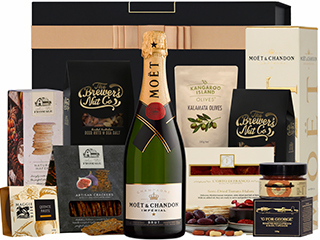 We even offer a free standard delivery for all Melbourne hampers in our catalogue! Where Do You Buy the Best Baby Hampers in Sydney? Looking for the best baby hampers in Sydney? You do not have to look far to find the perfect gift for births, christenings, and baby showers, since the finest baby hampers are easily found at the Hamper Emporium. Check out our collection today with some premium baby products from brands such as Peter Rabbit, Wedgwood, Marquise, and more. We are sure you will find the perfect baby hamper for your intended special occasion. Our baby hampers include a range of baby girl hampers, baby boy hampers and of course gender neutral baby hampers, all of which can be delivered across Sydney to welcome the latest Sydney-sider to the world. With our free personalised gift card, you can even include a message of your own to the new little one and proud new parents. Looking for an express baby hamper delivery in Sydney? We can help you with that too! What Can You Put in a Picnic Hamper for Sydney Residents? Searching for a picnic hamper, or looking to create one yourself? Get some inspiration from the gift hampers at the Hamper Emporium. Our picnic gift baskets are filled with delicious treats; this includes crackers, dips, chutneys, biscuits, cookies, chocolates, and all other things that usually go down well during a picnic. Need more examples? Be sure to check out the picnic gift baskets at the Hamper Emporium. Sydney residents certainly have a wonderful collection of gift hampers to choose from this year. No matter the special occasion your gift needs to match, our gift hampers collection always has the perfect hamper for you. At the Hamper Emporium, customers can find dedicated hampers for birthdays, anniversaries, births, Christenings, Father’s Day, Mother’s Day and many other special occasions we regularly celebrate. We even have a good selection of gifts specifically created for businesses and corporations, which could be personalised with corporate branding! The hampers of the Hamper Emporium are already known by many, but our hamper designer regularly adds new products to keep the hamper range refreshing and surprising. 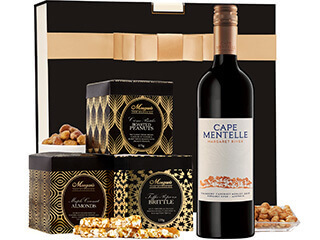 This year, our hamper designer added new products from the Robert Oatley Winery, one of the few wineries to receive a five-star review from James Halliday, but also other products from Butlers Irish Chocolates and Gourmet Regional to keep things interesting! So, if you are not yet familiar with some of the new products available in our Sydney hampers, be sure to check out our gift hampers range today and discover all the new and wonderful things waiting for you there!